You’ve always heard or read that avoiding soda is one of the best ways to keep your teeth healthy and strong, but what makes soda so bad for the teeth? Sodas have a huge potential for causing tooth decay and cavities, thanks to their high sugar and acid content. Let’s see how soda works to affect your dental health. The sugar in soda reacts with bacteria in your mouth, resulting in the formation of acid that attacks your teeth. The attack typically starts immediately after you sip the soda and it can last about 20 minutes. The process repeats itself every time you take a sip. You should realize that diet soda contains its own acid, which is also harmful to your teeth. The incessant acid attacks weaken the structure of the teeth enamel, making your teeth more susceptible to decay. If left untreated, the decay can lead to tooth loss. Erosion – When acid in soda gets into contact with your tooth enamel, the teeth’s outermost protective layer, erosion starts almost immediately. In the end, the surface toughness of the enamel will be significantly reduced, exposing your tooth to other dental problems. Dental Cavities – The erosion of your tooth enamel can lead to the development of cavities. Cavities, also known as dental caries, develop gradually in the teeth of individuals who drink soda on a regular basis. It’s worth noting that poor oral hygiene can accelerate the cavity development process. Limit your consumption of soda – Don’t drink more than 12-ounce can a day. 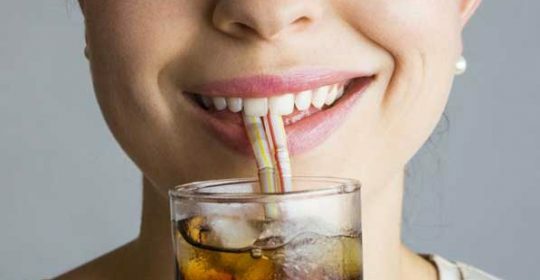 Use a straw to ensure the sugar doesn’t come into contact with your teeth. After drinking soda, swish your mouth out with water. This will dilute the sugar and acid, reducing their effect on the teeth. Soda is notorious for causing tooth decay and cavities. You can reduce its effects by consuming it in moderation, using a straw, and drinking lots of water.